AFTER THE COUNTRYSIDE HAS BEEN DRENCHED WITH MUCH NEEDED WATER, THE MAGIC BEGINS. 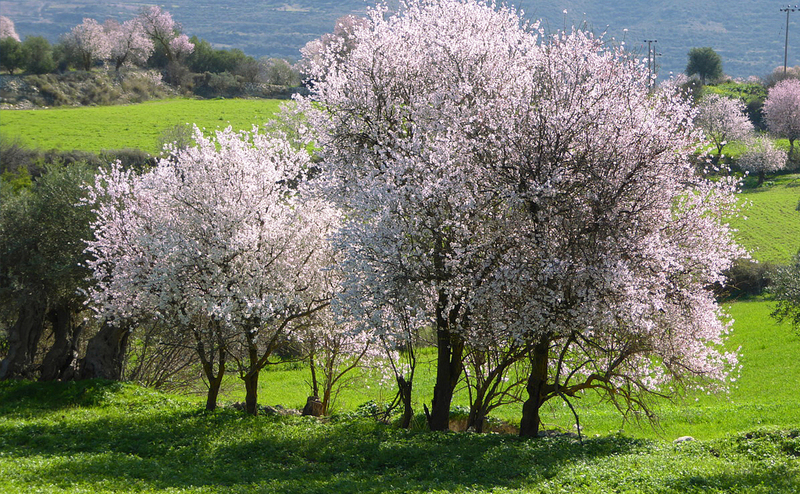 BY MID FEBRUARY THE FIRST ALMOND TREES BLOSSOM RESISTING THE COLD OR THE RAIN AND DECORATING AN ALMOST ARID LAND WITH THEIR GORGEOUS PINK AND WHITE FLOWERS. 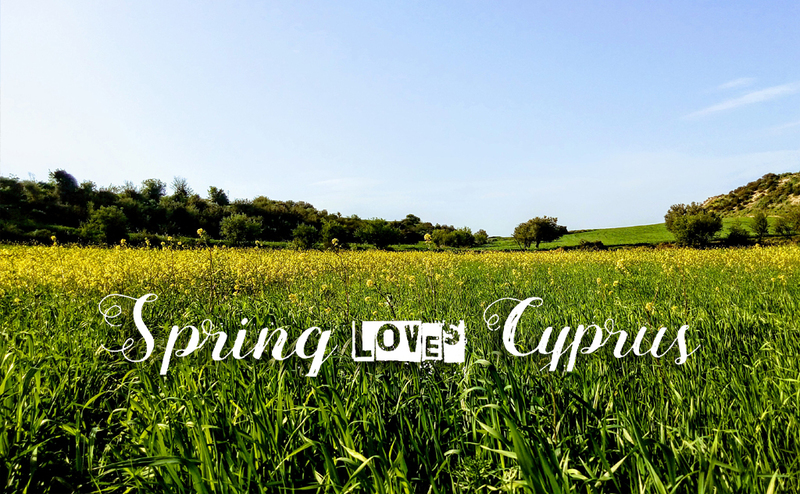 Cyprus may be best known for its long hot summers and its dry climate, but the countryside bursts into life in spring, when sporadic February rains and fresh March sun carpet the fields with brilliant wildflowers: yellow wood sorrel, purple wild rosemary, white wild garlic and red poppy anemone, creating a dazzling display that transforms the landscape. 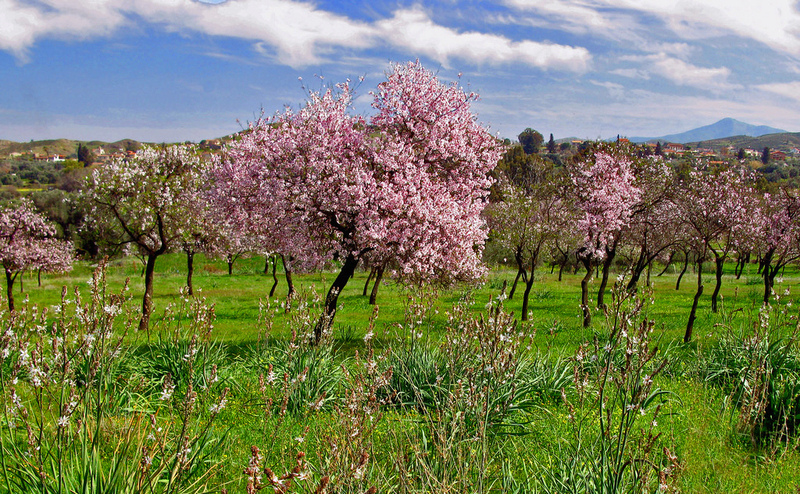 By mid February the first almond trees blossom resisting the cold or the rain and decorating an almost arid land with their gorgeous pink and white flowers. And now the flowers handsome almonds. 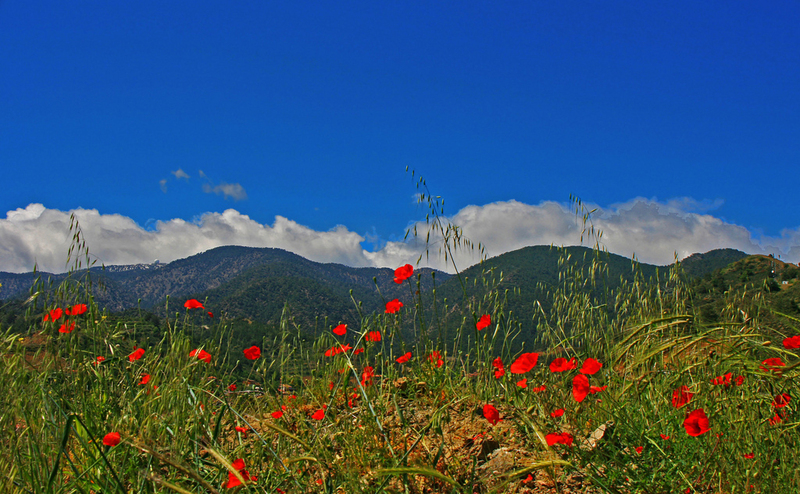 In fact, almonds on our island - the first herald of the approaching riot of colors and paints. 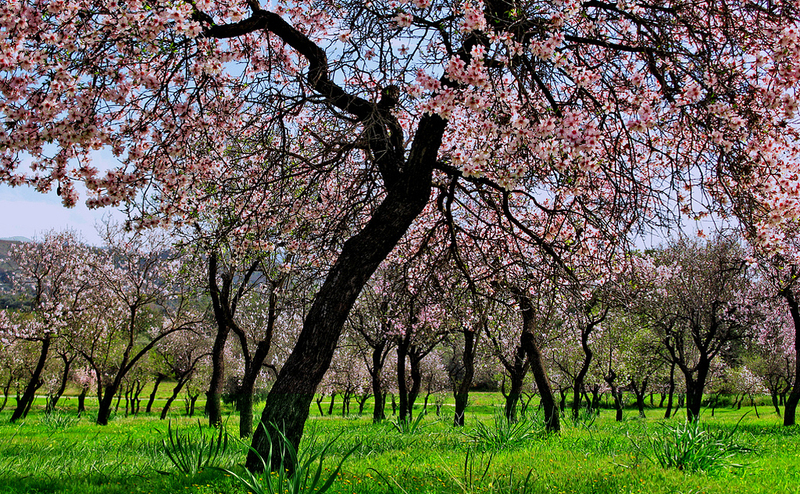 Almonds are grown in Cyprus since ancient times and consider it the king of all nuts in the world. In shades of color can be found, some almond cultivar will grow on the tree: white flowers - a bitter almond, used for the preparation of soft drinks and aromatherapy. 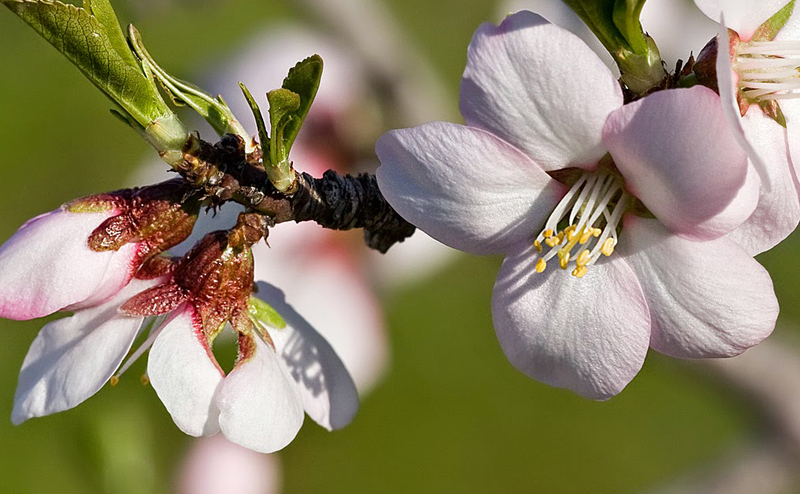 A pink flowers - sweet almond for making local sweets. SPRING IS ALSO WHEN SNOWMELT CAUSES THE MANY TRIBUTARY STREAMS IN THE TROODOS MOUNTAINS TO FILL BRIEFLY WITH COOL, FRESH WATER. Walking in the mountains is a treat for the nature lover; the distances are small enough that one can plan to be in the next village for lunch or dinner, while those desiring a little more solitude can, with a little planning, choose one of the more remote mountain paths and walk for hours with nothing but magnificent views and the sounds of the forest for company. 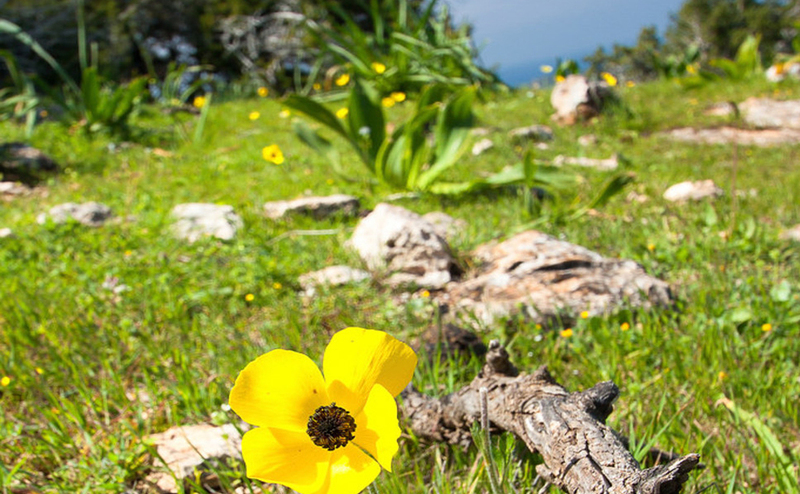 It never ceases to amaze us how plants can withstand such intense changes in temperature, yet still survive. 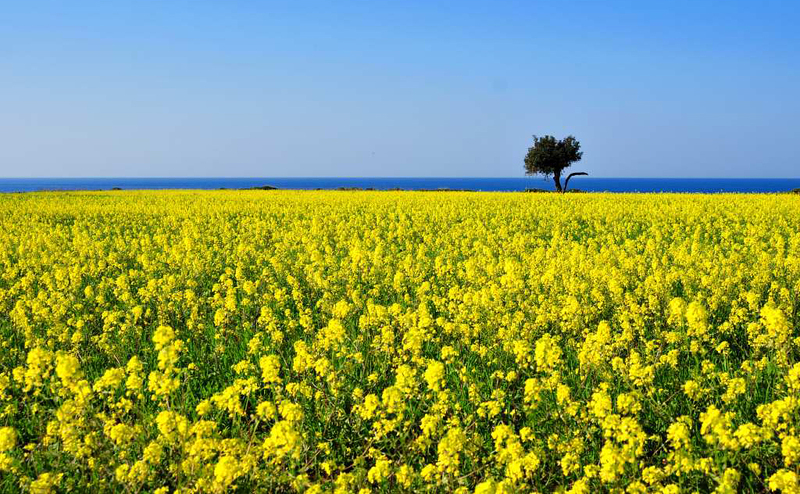 Once the middle of March arrives, every wild flower imaginable literally springs into life and the countryside is awash with the most amazing kind of flora. Temperatures go up to 20-23 Celcius (70-73 F) . We get rid of jumpers, coats and boots and change into lighter, more summery clothes.